U.N. human rights director in NYC, Craig Mokhiber. U.N. Israel-bashing personified. "President Trump has a growing Palestinian problem. Without steadfast U.S. insistence on Palestinian accountability and the supremacy of American law, it is about to get a whole lot worse for Israel and America. On Nov. 18, 2017 the Trump administration took the straightforward decision to follow the law. It told the Palestinian Liberation Organization (PLO) to get serious about peace or get out of the PLO's D.C. office. One week later, on Nov. 24, 2017, the State Department took the notice to vacate off the table. The administration was suddenly "optimistic" about Palestinian peace-seeking, law-respecting, bona fides. Congress has understood this dangerous scam and has, therefore, adopted two rules specifically targeting Palestinian use of the ICC. One relates to permitting PLO offices in the U.S., and the other relates to funding for the Palestinian Authority. Rule No. 1 is a provision of the Consolidated Appropriations Act, most recently adopted in May 2017. It says that if the Palestinians pursue war crimes charges against Israelis at the ICC, then a long-standing prohibition against PLO offices in the United States will kick in. The prohibition was introduced by Congress decades ago, but has not been applied because of the repeated use of a presidential waiver. The Appropriations Act provision denies the president a waiver when the ICC is brought into play. And here is flagrant Palestinian violation of the law: 'We have called on the International Criminal Court to open an investigation and to prosecute Israeli officials for their involvement in settlement activities and aggressions against our people.' That's Abbas at the General Assembly on Sept. 20, 2017. Palestinian lawfare at the ICC is a shameless in-your-face challenge to U.S. lawmakers. Ducking is not an option..."
A 19-year-old Israeli man was stabbed to death at a bus stop in southern Israel Thursday night, in what authorities believe may have been a terror attack. The incident occurred at 9:26 p.m. in the southern Israeli town of Arad, east of Beer Sheva. MDA emergency first responders were dispatched to the scene of the stabbing, but were forced to declare the victim after attempting to resuscitate him. Police say the stabbing took place at a bus station near a local mall, and that they are still investigating the circumstances of the incident. The assailant fled the scene shortly after the stabbing and remains at large. Police units are searching the surrounding area for the suspect. MDA paramedic Ziv Shapira described the scene of the stabbing: "When we arrived, we saw a young man, roughly 20 years old, who was lying on the ground unconscious and with no vital signs, and with stab wounds across his upper torso." "We provided life-saving medical care and performed advanced resuscitation techniques, but we were ultimately forced to declare him dead at the scene." An Israeli security guard reportedly shot a Palestinian, who was part of a group of rioters who were attacking schoolchildren on a field trip in the West Bank. According to United Hatzalah, IDF forces are now on the scene securing the children and granting care to the wounded Palestinian. Unconfirmed Palestinian sources said the man who was shot was 48-year-old farmer Mahmoud Udah, who was declared dead following the shooting. U.S. Ambassador Nikki Haley and the Trump administration are being pinned down in the trenches of the United Nations, outmaneuvered not only by smooth U.N. operators, but by Obama-era engineers. Twice in November, the United States failed to vote with Israel against the U.N. hordes, despite the oft-repeated words of Ambassador Haley about having Israel's back. The self-proclaimed "new sheriff in town" is finding out the hard way that failure to match action with talk is a fast-track to impotence at the U.N. Corall. On November 16, the Trump administration failed to support Israel on a resolution about the notoriously anti-Israel U.N. Human Rights Council. The vote took place in the General Assembly's Third Committee, a committee that focuses on human rights and is composed of all 193 U.N. member states. The resolution gave a pass to the annual report of the Council, a report that includes all of the body's anti-Israel goings-on. In U.N.-eze, the General Assembly "takes note" of the report and makes no criticism of any of its activities. The resolution was adopted by a vote of 117 in favor, 2 against, and 60 abstentions. Israel (and Belarus) voted against. The United States abstained. Haley's move is particularly surprising in light of the history of this resolution. The George W. Bush administration voted with Israel and against the resolution, while the Obama administration did not vote with Israel and merely abstained for the past three years. Haley is following in Obama's footsteps. 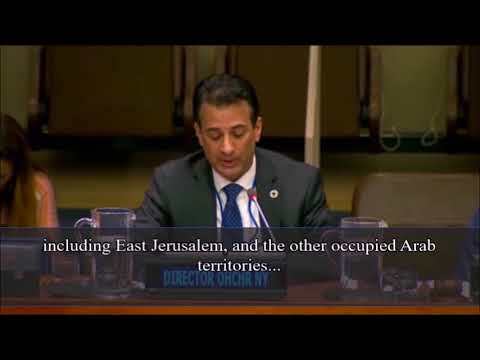 A special agenda item; seven special sessions; more than 70 resolutions, much more than a third of all the geographical resolutions; a Special Rapporteur with a biased and an infinite mandate, as well as endless numbers of reports – all targeting Israel – reflect the Council's attitude towards my country. ... When it comes to Israel the Council chooses once again to trample in the political swamp and to neglect so many people around the world who need urgent assistance. ... That is why Israel will vote against the adoption of the Human Rights Council's report. The United States strongly objects to the Human Right Council's disproportionate focus on Israel. ... On a positive note, we wish to highlight the important actions taken by the Council, including through renewing mandates on the human rights situations in Iran, the DPRK, Syria, and the fact-finding mission on Myanmar. 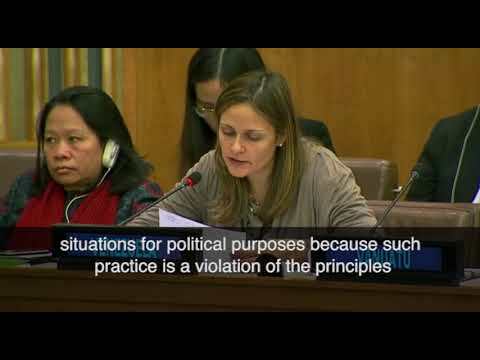 The Human Rights Council is in need of serious reform. ... We urge all Member States to join efforts that will reform the Council. ... For these reasons, the United States has abstained on this resolution. Set aside – for an instant – that Council action on Iran, North Korea and Syria has been a tiny fraction of the amount of energy, time and resources spent demonizing Israel, and has changed nothing for millions suffering in these human rights hell-holes. The Trump administration's rationale mirrors the Obama administration's stance on U.N.-driven anti-Israel and anti-Jewish pursuits: the inequality of Jews is a price worth paying to advance other goals. As if human rights principles can be built on a foundation of antisemitism. Moreover, no one at the United Nations - states or staff - believes that the Human Rights Council will undergo "serious reform." The United States does not have the votes to carry the day for that at the General Assembly. And as of now, the United States does not have the credibility needed to prevail. Promises of being ready, willing and able to withhold significant sums of money and support from the U.N. have failed to materialize. U.N. wheeler-dealers are of the view that the Emperor has no clothes. Everybody knows that the "reform" charade is a favorite U.N. shell game. And yet on September 19 and 20, both President Donald Trump and Vice-President Mike Pence hosted U.N. reform photo-ops that bought the U.N. time for more lethal mischief. Then on October 24 – and absent "serious reform" – President Trump astonishingly created "United Nations Day" with this call to action: "I urge the Governors of the 50 States, the Governor of the Commonwealth of Puerto Rico, and the officials of all other areas under the flag of the United States, to observe United Nations Day with appropriate ceremonies and activities." A few weeks later, on November 10, the American delegate refused to join Israel and vote against a U.N. resolution on the "Syrian Golan." The resolution contained zero criticism of Syria and demanded Israel stop "repressing" Syrians in the Golan. (That's the place where Syrians go for Israeli medical care and protection from their genocidal president.) The vote was 154 in favor, 2 against (Israel and South Sudan), and 17 abstentions – including the United States. Business-as-usual at the U.N. – umpteen promises by our U.N. ambassador to the contrary – notwithstanding. In December, the budget for the multi-billion dollar U.N. enterprise will once again come to a vote. The money will include myriad Israel-bashing and anti-American pursuits across the U.N. system. Another nice speech won't cut it. "Sabri Saidam, responsible for 'culture and higher education' in the Palestinian Authority, met with a delegation of the Arab Workers Union in UNRWA in Judea and Samaria and...expressed his office's opposition to changing the curriculum in UNRWA schools, stressing that the PA makes a clear distinction between enriching the content of the studies and changing the content of the studies. On November 7, 2017, UNRWA's Arab Workers' Union in the Gaza Strip issued an official statement condemning any change in the school curriculum of the host country - meaning the PA.
Last year, the Arab Workers' Union in UNRWA similarly thwarted an attempt by UNRWA to integrate the study of the Holocaust into its school curriculum..."
"Israel made its case on Monday to countries that contribute troops to the UN Interim Force in Lebanon (UNIFIL), saying they have to do much more to both inspect for, and report on, Hezbollah arms violations in southern Lebanon. Foreign Ministry deputy director-general for diplomacy Alon Ushpiz and deputy director-general for the United Nations and International Organizations Alon Bar briefed a number of ambassadors from states contributing to UNIFIL to voice Israel's expectations before a discussion on UNIFIL scheduled for the Security Council on Wednesday. Israel does not expect UNIFIL to confront the terrorist organization militarily, but it wants there to be a better record of violations, one diplomatic official said. Jerusalem has complained in recent months that it has provided information to UNIFIL about Hezbollah establishing outposts along the border with Israel, but that these complaints were summarily dismissed without serious investigation or inspection. Among the states contributing the most troops to UNIFIL are, in descending order: Indonesia, Italy, India, Spain, Ghana, Nepal, Malaysia, France, Finland and Ireland. According to Israeli officials, Israel's call for more reporting of Hezbollah violations of 1701 stems from the belief that both Hezbollah and its Iranian backers are sensitive to international opinion and do not want to have to deal with reports of violations. Israeli officials acknowledged that Israel and the UN do not see eye to eye on the effectiveness of the UNIFIL force. UN Secretary-General Antonio Guterres issued a report on Friday saying the UN was unable to confirm Israel's claims that the terrorist organization was arming itself in southern Lebanon, in violation of 1701. He said that although there are regular allegations of arms transfers to Hezbollah, the UN 'is not in a position to substantiate them independently.'..." "Weeks ahead of the expected completion of a U.N. database of companies that operate in Israel's West Bank settlements, Israel and the Trump Administration are working feverishly to prevent its publication. While Israel is usually quick to brush off U.N. criticism, officials say they are taking the so-called 'blacklist' seriously, fearing its publication could have devastating consequences by driving companies away, deterring others from coming and prompting investors to dump shares of Israeli firms. Dozens of major Israeli companies, as well as multinationals that do business in Israel, are expected to appear on the list. 'We will do everything we can to ensure that this list does not see the light of day,' Israel's U.N. ambassador, Danny Danon, told The Associated Press. Israel has long accused the United Nations, and particularly the rights council, of being biased against it. Israel is the only country that faces an examination of its rights record at each of the council's three sessions each year. Some 70 resolutions, or about quarter of the council's country-specific resolutions, have been aimed at Israel. That is nearly triple the number for the second-place country: Syria, where hundreds of thousands have been killed in a devastating six-year civil war. Israeli leaders and many non-governmental groups also complain that some of the world's worst violators of human rights, including Venezuela, Saudi Arabia, Congo and Cuba, sit on the council. Some Western diplomats have said the database could set a harmful precedent by blurring the line between business and human rights on issues that are better left to trade policy than the Geneva council..."